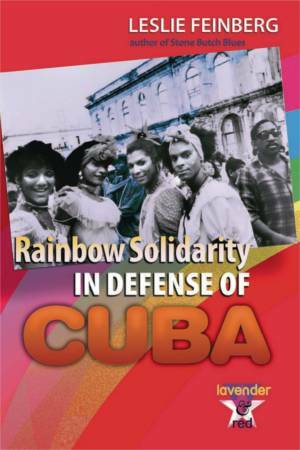 Ramiro Fúnez, Jane Ledesma, Monica Moorehead, Colin Ashley, Larry Holmes, Alexia Filpo and Simone Gamble. New York, Feb. 21. The 50th anniversary of the assassination of Malcolm X was commemorated in many cities throughout the U.S. on the weekend of Feb. 21-22, with events that included street actions against police terror, speak-outs, forums, vigils and more. A common thread running through many activities was the use of Malcolm’s legacy to forward the current fight against all forms of imperialism, especially racism and national oppression, in the form of the Black Lives Matter movement — by any means necessary. 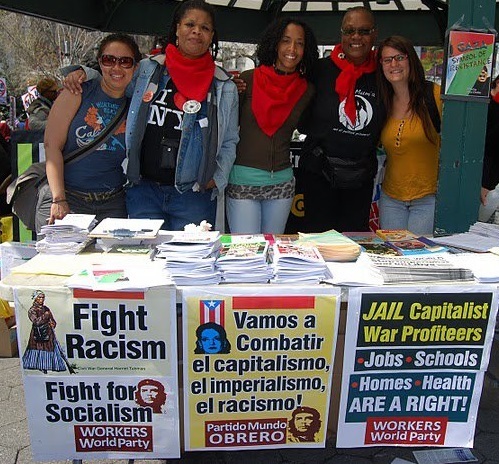 Workers World Party held forums and participated in numerous events with other progressive forces to honor this great anti-racist, anti-imperialist leader. Several activities are described below. The Baltimore chapter of WWP and Fight Imperialism, Stand Together (FIST) youth group held a special joint forum to honor Malcolm X on Feb. 22. Despite a major snowstorm, the Baltimore Solidarity Center meeting space was packed. All seats were filled by a diverse crowd of mostly young activists of all nationalities. Abayomi Azikiwe, Detroit, Feb 21. The event featured Larry Holmes, first secretary of WWP, who spoke on the legacy of Malcolm X and what it means for the Black Lives Matter movement. The program and discussion lasted more than three hours because of the number of lively questions and comments. The majority of participants came from the Black Lives Matter movement. It was standing room only at the Malcolm X tribute hosted by Detroit WWP and FIST on Feb. 21. Chaired by Tachae Davis, a member of both groups, the program included a video of an interview with Malcolm X as well as talks and a delicious soul food dinner. Marcina Cole spoke on the struggle to free political prisoner Rev. Edward Pinkney of Benton Harbor, Mich., who is scheduled to be sentenced on Feb. 27. Pinkney was convicted on charges of allegedly forging dates on petitions to oust the city’s mayor. Joe Mchahwar of FIST and WWP presented the militant, anti-racist history of the Boston School Bus Drivers Union, United Steelworkers Local 8751, and told of the Veolia corporation’s campaign to bust the union and criminalize its leaders. 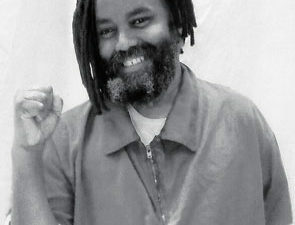 Davis spoke about Assata Shakur, Black Panther Party member and political exile, who escaped from prison in 1979 and took refuge in revolutionary Cuba. Debbie Johnson of WWP exposed the role of the corporate media in perpetuating racist lies and urged the audience to read Workers World newspaper for revolutionary and working-class truth. After the meeting, copies were quickly grabbed up. Abayomi Azikiwe, a leader of the Moratorium NOW! Coalition and Detroit WWP, as well as editor of the Pan-African News Wire and WW contributing editor, gave the main presentation on the struggle legacy of Malcolm X. His powerful and informative talk, entitled “Malcolm X: Revolutionary Voice of Struggle and Liberation,” was published by Modern Ghana and can be read at tinyurl.com/qevsm8l. 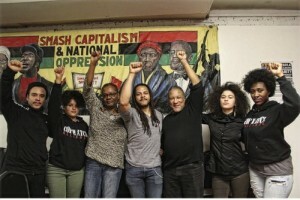 The New York City branch of WWP held “A Tribute to Malcolm X” forum at the Solidarity Center on Feb. 21. Despite a winter storm, a standing-room-only crowd participated in a more than two-hour dialogue on how the contributions made by Malcolm X impact the Black Lives Matter movement today. Opening remarks were made by Alexia Filpo and Colin Ashley from the Peoples Power Assembly; Simone Gamble from Brooklyn’s East Flatbush Cop Watch; Ramiro Fúnez from FIST and Larry Holmes from WWP. Three videos featuring Malcolm X were played. “A walk in his footsteps in Harlem,” organized by the PPA and Occu-Evolve, took place earlier that day. It started where Malcolm X once held street meetings at 125th Street and Adam Clayton Powell Boulevard, followed by a walk to the police precinct where he organized a protest against police brutality in 1957. 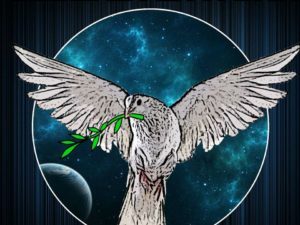 The Buffalo, N.Y., Anti Racism Coalition hosted an event Feb. 22 to honor all young Black lives stolen by state violence, with speakers, poetry, music and a reading of Malcolm X’s words. 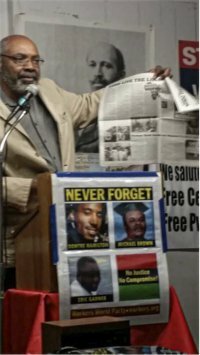 The Los Angeles WWP branch organized a Feb. 21 film showing of Spike Lee’s 1992 feature film, “Malcolm X,” starring Denzel Washington. After the movie, a political discussion was held on how Pan-Africanism, international solidarity, the right of Black people to self-defense and other concepts popularized by Malcolm X apply to today’s movement against state violence and for Black Liberation. The Durham, N.C., branch of WWP held a “Malcolm X: Black Liberation and Black Lives Matter” forum on Feb. 21 at the Hayti Heritage Center. Featured speakers included Manzoor Cheema from Muslims for Social Justice and Larry Hales from WWP and PPA. The meeting explored the movement that Malcolm came to inspire and represent, his thoughts, political practice and militancy. Other Malcolm X/Black History Month WWP forums are scheduled for Philadelphia on Feb. 24 and Boston on Feb. 28. Contributors to this article include Sharon Black, Ellie Dorritie, Kris Hamel, Andy Katz and John Parker.